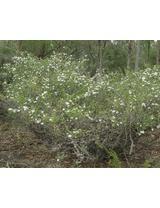 Description: Shrub to > 2 m high, bark close, ultimately gnarled, younger stems pubescent; new growth often colour-tipped. Leaves ± circular, mostly 4–7 mm long and wide, thick, incurved; apex rounded, acute or acuminate, usually infolded and recurved, point blunt; base tapering, rounded or somewhat cordate; petiole pubescent, c. 1 mm long. Flower solitary, c. 30 mm diam., white to purplish pink. Hypanthium 3–6 mm long, glabrous or with an appressed pubescence. Sepals 3–4 mm long, mostly glabrous. Petals 8–12 mm long. Stamens 4–6 mm long. Ovary 5-locular. Fruit 8–12 mm diam., valves ultimately exserted beyond the rim. Distribution and occurrence: Usually grows in shrubby and heath habitats but also in sclerophyll forest on rocky escarpments, south of Sydney to Nerriga. Other Australian states: Vic. *W.A.